If you have lost a tooth or multiple teeth through trauma disease, or decay, then dentures will be used to replace the missing tooth or teeth. The most common association people have of dentures are a full set of removable false teeth. However, dentures come in a variety of options; you can have removable, partial or full dentures, dental bridges, or non-removable implants.The right choice is down to a number of factors including the condition of your teeth and gums, and the expense involved. Removable dentures are the most common way to replace missing teeth. The old image of false teeth is now vastly outdated, and some cosmetic dentures are indistinguishable from natural teeth. They come in a variety of materials; from plastic resin to the more natural and hard wearing porcelain. If your dentist has spent a great deal of time in the construction and fitting of your dentures then they can enhance your face, and give you back a natural looking smile. Choosing between removable dentures, dental bridges and dental implants should be a decision made with your dentist. For some, dental implants are the ultimate choice as they are non-removable, are set firmly into the jawbone, and can last a lifetime. However, for some people, dental implants are extremely expensive, and as they are cosmetic procedure, the expense will usually have to be paid by the patient. The procedure time for implants will normally be around eight months, this time scale may be longer if additional bone graft treatment is needed for patients with periodontal disease or fragile jawbones. Again, dental bridges are an excellent choice of denture due to the fact that they can be non-removable. However, dental bridges will only work if there are other teeth in the mouth to anchor to. 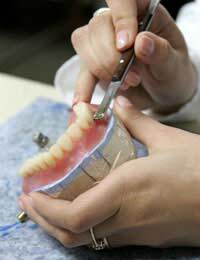 The longevity of most dental bridges is around 15 years and they are also more expensive than normal dentures. Many people opt for removable dentures simply down to convenience, expense and timescale. If you are having teeth removed then immediate dentures can be used to fill the gap. The size of the immediate dentures is decided before the removal of any teeth and is achieved by making a model before tooth removal. This means that you can wear the dentures as soon as the tooth is extracted. However there may be changes to the gums due to the healing process post extraction, and a return visit may be need to readjust the dentures. The construction of conventional dentures will take place over a number of visits. The construction will begin once the healing process to the gums has been achieved. A wax model will be made of the inside of your mouth, including any remaining teeth, and the gaps of the missing tooth, or teeth. Colour charts will be used to make an exact natural match with your remaining teeth. This wax model will be sent to a laboratory for the denture construction. With conventional dentures the most important part of the procedure is the try in phase. This stage of the procedure is vital in order to achieve the correct fit and size of the dentures. The try in phase should be performed while the denture is still in the wax model stage, this way adjustments can easily be made. Make sure the dentist you choose is professional enough to allow numerous try ins. Word of mouth will be the best reference you can have when choosing a dentist to fit you with dentures. If you have never worn dentures before, there may be an adjustment period while your mouth becomes accustomed to them. Dentists will usually advise that they are not removed from the mouth for the first few days, except for cleaning. You may find eating feels different and certain words may be harder to pronounce until you get used to the denture. These problems will disappear very quickly as you get used to wearing the dentures. The cleaning of dentures really depends on the type of dentures you have. If you have a partial denture with only one or two teeth fixed to a plate, then you will need to clean them as part of your at home dental care routine, and they should be brushed every day to remove food particles and plaque. A full set of either upper and/or lower dentures should be cleaned in a soaking solution; if dentures are left in the open air they will dry out and loose shape. Over time dentures will become loose due to natural shrinkage of the gum. Dental adhesive can be used to keep the denture firmly in place, but this should really only a temporary solution. A dental visit should be schedule for readjustments, or the fitting of new dentures.